Ideas are Free. Take this one. I have an affinity for teeny tiny delicate things so the small purple flowers blossoming on some weeds in our front lawn caught my attention. I thought I’d snip a small sprig (and a single flower from our accidental Bougainvillea) and give a weed a new identity by having it decorate our bathroom…our teeny tiny bathroom (though it’s blossoms fell before I decided to snap a picture). For vases I used the glass lids of some vintage oil & vinegar bottles my wife got at an antique store a while back for use as a bathroom decorations (the bottles themselves are seen in the photo above on the left and right sides). 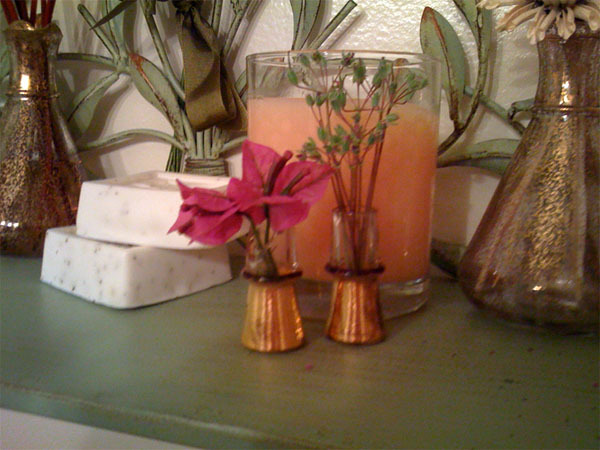 She had the clever idea to use the bottles as oil vases to put scented oil sticks in. To enhance our bathroom enhances , my wife found oil sticks with pretty decorative flowers on the end of them which you can sort of almost see at the top right corner. Does this idea work for your space? Do you have some throwaway flowers and an eensy vase? Try it, photograph it, and send it my way and I’ll post it here.